1. PURPOSE. 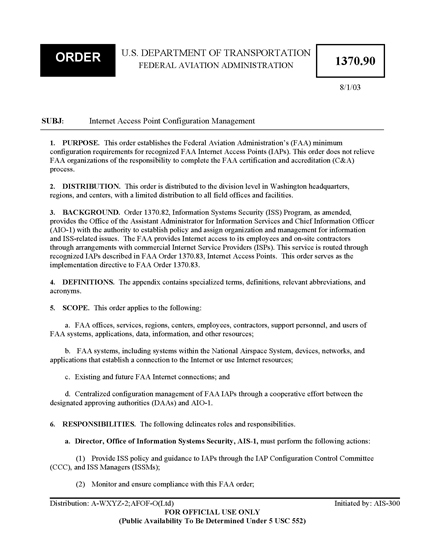 This order establishes the Federal Aviation Administration’s (FAA) minimum configuration requirements for recognized FAA Internet Access Points (IAPs). This order does not relieve FAA organizations of the responsibility to complete the FAA certification and accreditation (C&A) process. 2. DISTRIBUTION. This order is distributed to the division level in Washington headquarters, regions, and centers, with a limited distribution to all field offices and facilities. 3. BACKGROUND. Order 1370.82, Information Systems Security (ISS) Program, as amended, provides the Office of the Assistant Administrator for Information Services and Chief Information Officer (AIO-1) with the authority to establish policy and assign organization and management for information and ISS-related issues. The FAA provides Internet access to its employees and on-site contractors through arrangements with commercial Internet Service Providers (ISPs). This service is routed through recognized IAPs described in FAA Order 1370.83, Internet Access Points. This order serves as the implementation directive to FAA Order 1370.83. 4. DEFINITIONS. The appendix contains specialized terms, definitions, relevant abbreviations, and acronyms. d. Centralized configuration management of FAA IAPs through a cooperative effort between the designated approving authorities (DAAs) and AIO-1. 6. RESPONSIBILITIES. The following delineates roles and responsibilities. (5) Provide recommendations for perimeter routers to filter traffic before it gets to the internal FAA network. (c) Hands-on experience with networking concepts, design, and implementation so that IAP equipment is configured correctly and administered properly. (9) Provide the Computer Security Incident Response Center (CSIRC) with pertinent information necessary to contact the IAP administrator, designated alternate(s), or ISSM. These individuals may need to be contacted for notification of outages or security events and for coordination to ensure a timely response. (13) Ensure that availability, integrity, and confidentiality of FAA resources are maintained and that individuals and organizations are accountable for the use of IAP services. (7) Each IAP administrator is responsible for the operation and maintenance of the IAPs. d. The ISSM for the line of business (LOB) operating the IAP must provide security information to the IAP administrator and take necessary risk-mitigating actions. e. The Chief Information Officer of an IAP tenant must ensure that all of its Internet services operated within the DMZ are registered per FAA Order 1370.84, Internet Services. Cache Engines. Referred to as content delivery devices, these are devices close to users that save (cache) Web pages and possibly file transfer protocol (FTP) and other files that all server users have requested so that successive requests for these pages or files can be satisfied by the cache server rather than requiring the use of the Internet. A cache server not only serves its users by getting information more quickly but also reduces Internet traffic. Cache engines are essential for enhancing performance in saturated networks and accelerate content delivery. A cache server is almost always also a proxy server. Computer Security Incident Response Center (CSIRC). The CSIRC is FAA’s 24/7 computer security center. The CSIRC monitors FAA network activity and outages, processes all reports of computer security incidents against FAA Internet access points (IAPs); installs, operates, and maintains intrusion detection systems (IDSs) at the IAPs; and provides the local IAP administrators with access to IDS data relative to their IAP. Configuration Control Committee (CCC). A committee designed to provide guidance for all issues relating to IAP configuration management and access to FAA systems and resources, perform comprehensive reviews of IAP justification papers, and review requests for deviation from IAP standards. This committee also makes recommendations on network, hardware, and software requirements; equipment standards; component configurations; and protocols and services authorized at each IAP. Dedicated Point-to-Point Virtual Private Network (VPN) Tunnels. High-speed broadband connections that provide a cost-effective solution for connecting remote offices and extranets. Demilitarized Zone (DMZ). A computer host or small network inserted as a “neutral zone” between an organization’s private network and the outside public network. In practice, DMZs act as proxy servers to prevent outside users from getting direct access to a server containing proprietary data, while supplying publicly available information. Internal Users to External Enterprises VPNs. IAPs that allow FAA personnel to access external enterprises in support of an FAA business need. Internet Access Point (IAP). Any physical or logical connection to the public Internet. An IAP includes any direct or permanent connection or any dial-up or temporary connection to the Internet. IAP Administrator. An individual responsible for the configuration, account management, and performance of a computer network. IAP Tenants. Organizations (lines of business or staff offices) who own or possess servers located within the DMZ(s) of the IAPs. Internet Access. The connection to the public Internet or access to any Internet resource or information using any application, program, software, utility, or tool, for any reason or duration. Internet access includes any permanent or temporary connection to the Internet. Internet Service Provider (ISP). The connection point or organization outside the FAA, connected either physically or logically to an IAP, that is the means by which the IAP gains access to the Internet. Internet. A global network of independent hosts and communications facilities that connect users to those hosts. The term “Internet” also may refer to the content presented on the hosts or transmitted through the network. The FAA may contribute information and resources to the Internet for public consumption. Intranet. The FAA’s internal or private network used to share information and resources within the FAA community. Information and resources on the Intranet are not made available to the public. Intrusion Detection Systems (IDS). A type of security management system for computers and networks that gathers and analyzes information from various areas within a computer or a network to identify possible security breaches, which include both intrusions (attacks from outside the organization) and misuse (attacks from within the organization). Network. Communications hardware and software that allow a user or system to connect to another user or system and can be part of a system or a separate system. Examples include local area networks, wide area networks, and public networks such as the Internet. Perimeter Router. A device that routes data between one or more networks and a third-party Internet gateway. A perimeter router is sometimes contrasted with a core router, which forwards packets to computer hosts within a network (but not between networks). A perimeter router is an example of an edge device and is sometimes referred to as a boundary router. Proxy Servers. Proxy servers represent users by intercepting their Internet requests and managing them. Proxy servers are required because Agency Data Telecommunication Network 2000 does not enable default routing. A proxy server helps match incoming messages with outgoing requests and is in a position to also cache the files that are received for later recall by any user. To the user, the proxy and cache servers are invisible; all Internet requests and returned responses appear to be coming from the addressed place on the Internet. Redundant Firewalls. A set of related programs, located at a network gateway server, protecting the resources of a private network from users from other networks. A firewall examines each network packet to determine whether to forward it toward its destination. The firewall allows remote access in to the private network or DMZ by the use of secure logon procedures and authentication certificates. 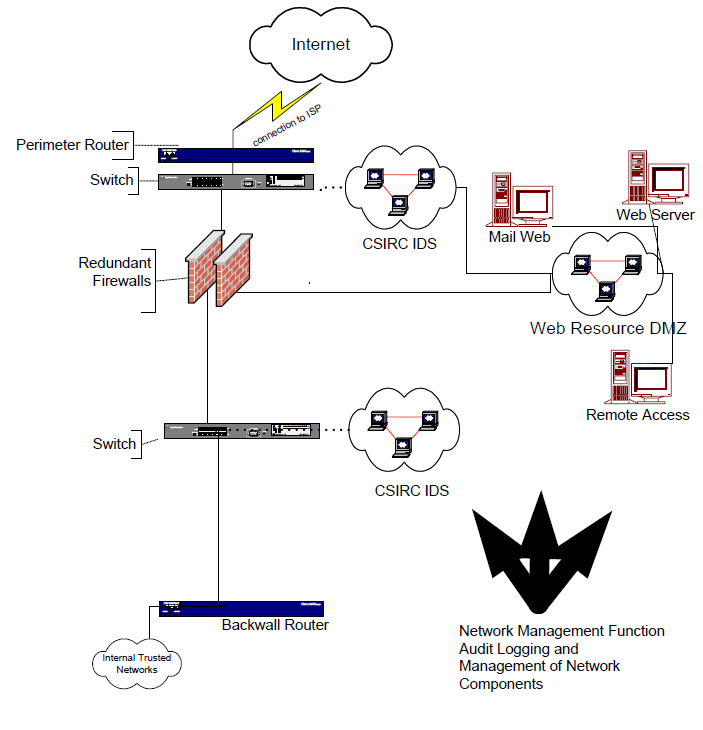 Redundant firewalls allow all of the above measures to happen by working in series. If one firewall fails, the redundant firewall next in the series will take over the functionality. Redundant firewalls provide a measure of security so that there is no single point of failure. User-to-Enterprise Virtual Private Networks (VPNs) for Telecommuters. VPNs that allow mobile workers, telecommuters, and FAA authorized users to gain access to the FAA intranet, providing users significant flexibility and efficiency. Virtual Private Networks (VPNs). A connection between a remote computer and a server on a private network that uses the Internet as its network medium or a remote network and another network that uses the Internet as its network medium is known as a VPN. The remote computer and the network server then establish a secured connection that protects the data exchanged between them as it travels over the Internet. This technique is called tunneling, because the connection runs across the Internet inside a secure conduit, protecting the data in the way that a tunnel under a river protects cars from the water above it.